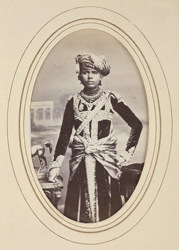 BHAVNAGAR: Sir Takhtsinghji Jaswantsinghji, Thakur of Bhavnagar (1858-1896). bl.uk > Online Gallery Home	> Online exhibitions	> Asia, Pacific and Africa Collections	> BHAVNAGAR: Sir Takhtsinghji Jaswantsinghji, Thakur of Bhavnagar (1858-1896). Three-quarter length standing carte de visite portrait of Sir Takhtsinghji Jaswantsinghji, Thakur of Bhavnagar (1858-1896) from the 'Album of cartes de visite portraits of Indian rulers and notables' by Bourne and Shepherd, early 1870s. Bhavnagar, now in Gujarat, was headed by chiefs from the Gohel rajputs. The town of Bhavnagar was founded in 1723 by Bhausinghji. Jaswantsinghji succeeded in 1870 as a minor and reached majority in 1878. He studied at the Keating Rajkumar college at Rajkot. He was given the title of Grand Commander of the Star of India and the title of Maharaja.